From August 1991: oh the horror... more small-screen scarefare given the EPI-LOG treatment in the ninth issue. FRIDAY THE 13th; THE SERIES was, like FREDDY'S NIGHTMARES covered the previous issue, another one of those ill-advised brand spin-offs perpetrated in the Eighties. Except this one can bugger-all to do with the movie franchise but formed part of Paramount's initial triple-play of first-run syndicated genre shows alongside STAR TREK THE NEXT GENERATION and WAR OF THE WORLDS. The long-forgotten (but actually rather good) 1991 revival of DARK SHADOWS was scuppered by the outbreak of fighting in the first Gulf war. Episodes were pre-empted and shuffled around the schedules in favor of news coverage and it never had a chance to find an audience. It did, however, spawn a really nice series of fully-painted comics from the long-defunct Innovation Comics. 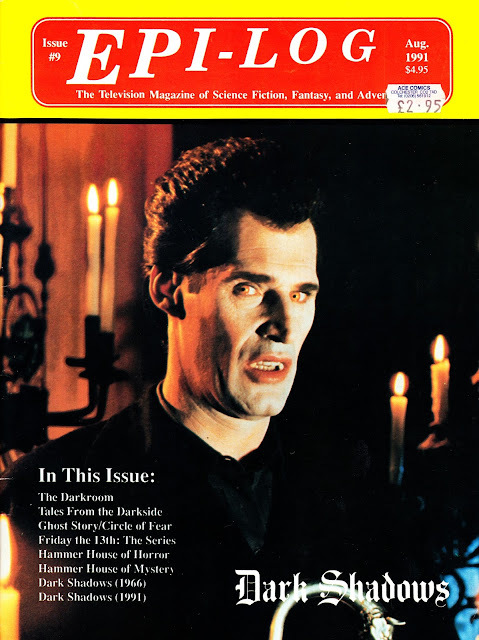 The show has been released on DVD but blundering MGM used the wrong prints so scenes shot day-for-night (a common trick to make production easier and cheaper) are included without the intended post-production grading, robbing them of atmosphere and making the whole thing into a daytime vampire show. Whoops. I actually quite liked Friday the 13th: The Series (I had a major crush on Louise Robey), and the first season of War of the Worlds was actually not bad (just a shame they had to ruin it and go all post-apocalyptic without half the cast). Dark Shadows was fantastic, and it's such a shame it never found its audience. Ben Cross made a brilliant vampire. If they ever want to do a proper cinematic revival, I'd go back to that creative team. there actually was a recent movie version made by tim burton featuring johnny depp as barnabus and the late Christopher lee in one of his last screen appearances. I found it quite enjoyable despite never having seen either tv incarnation. Ben Cross also played sarek in the recent trek movie reboot, its just a shame they didn't bring him back for the sequel. I think I must have been one of the very few people to actually go and see the recent film version in the cinema. I'm not that familiar with either of the TV incarnations (and I believe there was a third TV venture a few years ago that didn't get past a never-broadcast pilot) so, on its own merits, I thought the Tim Burton film was quite good. Likewise, the two big screen MGM films from the early Seventies also come recommended based on the same criteria. the never screened pilot starred alec newman who had previously featured in the tv version of DUNE which compares favourably with david lynch's version. The tv sequel CHILDREN OF DUNE was even better.